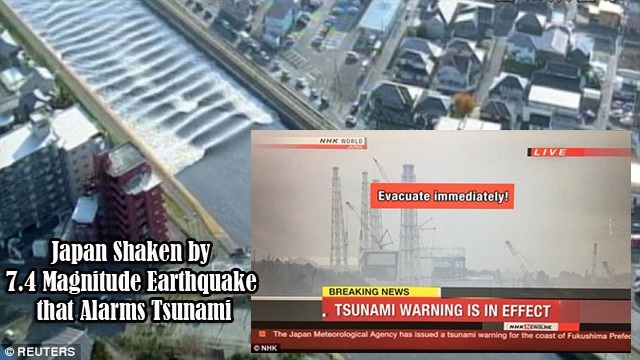 A powerful earthquake hit Northern Japan interrupting the cooling functions on 3 nuclear power plants in Fukushima that triggered a tsunami where the same region was demolished by an enormous quake in 2011. Fortunately, there were no deaths or serious injuries hours after the 7.4 magnitude earthquake at 5:59 am local time according to a report by Japan Meteorological Agency (JMA). The agency also said that it was an aftershock from the magnitude 9.0 earthquake 5 years ago and there is a possibility that there could be more quakes in the next few days so the residents must remain cautious for a week. CBC reporter Adam Walsh said that the massive quake was felt in Tokyo and it dispatch thousands of residents to flee on higher ground. All nuclear power plants in Japan that were threatened by tsunami were shut down such as Tokyo Electric Power Co’s Fukushima Daiichi Nuclear Plant that was damaged in March 2011’s disaster. Tepco struggled because of it where 7000 of their workers are still at the site cleaning and decommissioning the hazardous waste which will took for 40 years. Meanwhile a dramatic footage captured a flaming object across the sky hours after the huge earthquake. The dramatic video was taken by 16- year old Asuka that displayed a mysterious burning light across the evening sky. Asuka captioned that it’s a movie he took while preparing to die. He also thought that it was a meteorite because of the earthquake but it’s not. Another video was also recorded where the Tokyo train stations were rattling violently. Passengers were heard panicking inside while some were calmly going their way out at the Akihabara district. British expat Paul Ferguson also showed the moment huge sirens for tsunami started ringing out. He tweeted that it was scary and he told everyone not to worry because he is living on a high ground. Because of the lessons from 2011 Earthquake, the authorities are now sending tsunami warnings through mobile phones.